You are here: Home � All Deals , Featured , Retail: Clothing Toys Baby Shoes Children � 50% off several Fisher-Price toys at Kohl's - Prices start as low as $4.49 after discount. 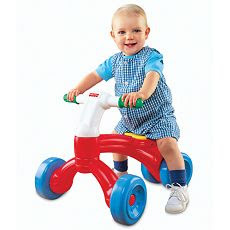 50% off several Fisher-Price toys at Kohl's - Prices start as low as $4.49 after discount. Kohl's is having a site-wide sale on Fisher Price toys with several toys discounted up to 50%. Kohl's is also offering free shipping on orders over $75. Some of the Toys available in this promotion are: Fisher Price Little People sets, Sesame Street and Elmo themed toys, Dora the Explorer toys, Precious Places gift sets, and Ready Steady Rider.